ASDA showcases, in a new advert, the latest range of tops and T-shirts for kids, highlighting that prices start from £4. 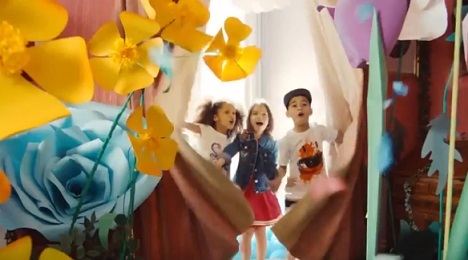 The spot features several boys and girls discovering the Easter fashion collection from George, which includes a variety of colorful tops and T-shirts. A yellow flower in a pot, that sings “Do Your Thing” by Basement Jaxx, joins them on an adventure into the sky with a hot air balloon. Among the shown pieces are the Sequin Slogan T-Shirt, crafted in a soft cotton-blend fabric, with crew neck, short sleeve, turn-un cuffs, and sequin slogan that reads “Say Hey”, the Star Print Jersey Dress, crafted in pure cotton, with short sleeve, an elasticated waistband with a star print and slogan design and glittering stripes at hem, the Embroidered Denim Pinafore Dress, paired with the Ruffled T-Shirt, the Embroidered Patch Denim Jacket, and others. “Do Your Thing” originally appeared on Basement Jaxx’ second studio album, “Rooty”, launched in 2001, and was released in August 2002 as a 12″ Limited Edition, vinyl single in UK and as a CD single in Australia. In other recent spots, the British supermarket retailer showcased its Easter offerings, which include Easter meal under £2.50 a head, Easter eggs 3 for £10, lamb leg for £4.97/kg, and more.